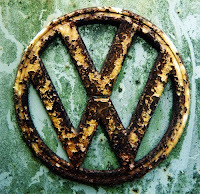 bout fifteen years ago I bought a 1973 Volkswagen Super Beetle with the intent of restoring it. I never really drove it since almost immediately I had it torn apart and sorted in many (many) bags/boxes and spread across two provinces. Now I am tasked with the challenge of reassembly. When I purchased the car it didn't have any front seats, another reason why I never really drove it. Over the years I was able to find a pair of 1974 seats quite cheaply. Granted they need some restoration and reupholstering but I had all the parts I needed - or so I thought. 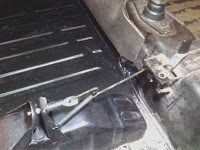 Recently, when it came time to fitting the seats in the car, I realized that I was missing the mechanism that holds/releases the seat so it can be adjusted forward and backward. I searched my stack of various VW manuals as well as the Internet to try to identify what these pieces looked like or even what they where called - no luck. Unfortunately I still don't know the official names and part numbers of these pieces. 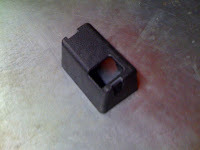 There is also a cosmetic piece (113 867 231 driver side, 113 867 232 passenger side) that covers the lever box. This black plastic piece, one per side, snaps over the ugly metal cage that is attached to the tunnel and houses the lever. So that's it. Hopefully this blog helps someone else who is staring at their Bug floor and scratching their head. This mechanism should be the same for all 1973-and-newer Super Beetles. 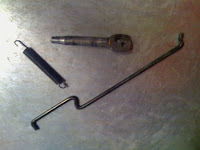 Oh, and when putting the spring on, be careful not to let it slip and hook your finger. It will likely hurt and bleed a lot. Just trust me on this. challenge I recently took on was to bi-amp my Magnepan IIBs. 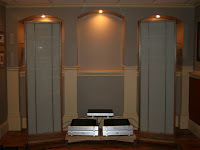 I managed to get hold of two beautiful Bryston 4BSST amps and a matching Bryston 10B-LR active crossover. The active crossover splits the line level frequencies and feeds the amps, one per side, and bypasses the Magnepan factory crossovers going direct to the high and low panels. I don’t have any issues with the factory passive crossover, I just wanted to be able to dedicate a channel to the highs and probably more importantly, have a dedicated channel for the lows. 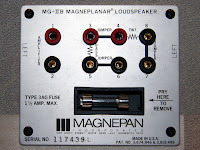 The Magnepan MG-IIB model is just begging to be bi-amped. The friendly folks at Magnepan were thoughtful enough to build the IIB with removable jumpers making bi-amping a simple plug-and-press-PLAY►. 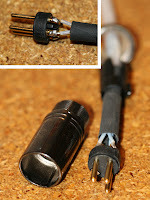 To use the internal passive crossover, three jumpers are located across the posts as labeled (3-4, 5-6, and 7-8) and the single pair of speaker cables connect across the posts labeled "AMPLIFIER" (1 and 2). 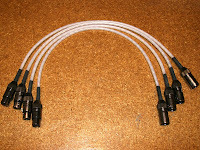 In order to bypass the internal crossover, all three jumpers are pulled, the low is connected to posts 3 and 5, and the high is connected to posts 4 and 8. The jumpers can then kept in a location you will soon forget. Apparently in the days of Air Supply and acid-washed jeans, audio manuals were written in all-caps. Perhaps there is a joke in there about audiophiles being deaf and needing to yell - but I'm not going to touch it. Interestingly though, Magnepan chose to "spread" the low and high pass - I'm guessing this is to flatten the lobing error produced by the lower order Butterworth crossover and create what they refer to as a "flat acoustical response". Remembering that the frequency doubles for every octave, there is a gap of two octaves between 400Hz and 1600Hz. The midway point is 800Hz and is reached at -9dB with the 6dB/oct. slope. Low-Pass (LP): (400Hz, -3dB) at 6dB/oct. High-Pass (HP): (1600Hz, -3dB) at 6dB/oct. This gives an effective crossover point of 800Hz at -9dB. Without getting into a “what’s-the-optimal-crossover-point” discussion, for now I trust the brains at Magnepan and I will keep the same crossover frequency of 800Hz as designed. But since the 10B-LR’s Linkwitz-Riley filters are formed by cascading two second order filters, it has a much steeper slope of 24dB/oct.. 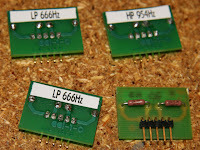 The question then became, what should the new low-pass (LP') and high-pass (HP') be? Using the same low-pass and high-pass as the factory specs would create a huge gap. I knew my new LP' and HP' would need to be much closer. I decided to work under the assumption that Magnepan's primary motivation for the "spread" was compensation for the slow roll-off of the Butterworth filters and avoidance of a lobing error. Fortunately with a Linkwitz-Riley filter I don't need to worry about a spread at all since it produces moderate roll-off and a flat sum, resulting in zero lobing error. Without a spread, both my LP' and HP' can be 800Hz at a slightly louder -6dB. Low-Pass (LP'): (800Hz, -6dB) at 24dB/oct. High-Pass (HP'): (800Hz, -6dB) at 24dB/oct. 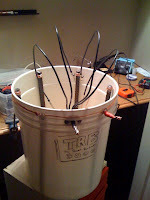 This gives an effective crossover point of 800Hz at -6dB. 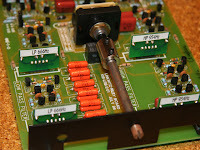 As you might have noticed, there are no frequency selection knobs on the faceplate of the 10B-LR. Instead of presets, the low and high-pass are set using "programming boards" which plug into each channel’s pull-out circuit board. Each of these programming boards (a total of four per channel) is programmed using a pair of ±1% metal film fixed ¼W resistors. At a price, Bryston will build these little boards for your preferred frequency – but it’s really easy to reuse and modify existing boards with some simple de-soldering. 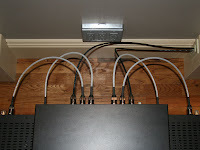 Note that there are multiple tables for different versions of the 10B-LR based on the capacitors used on the channel. In this case the low-pass is C1 = 40nF and C2 = 20nF and high-pass is Ca = Cb = 4.7nF. Not only do Magnepans look unusual, these also run at a nonstandard 5Ω. Each channel of the 4BSST delivers a hearty 300W at 8Ω. So admittedly, it is a bit too much umph for these circa 1981 speakers, however I’ve found it quite safe up to just over half volume on my Bryston BP-25 DA. Besides all that, it looks pretty cool too. dmittedly this is the most lame DIY ever but I had to start by posting something. 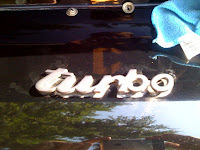 This morning I took about fifteen minutes to clean under the “turbo” badge script on my 1984 Porsche 930. 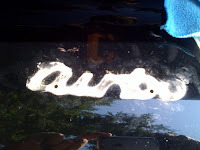 Being such a focal point on the car, it was a bit of a dishonor with about twenty-five years of wax and crud built up. 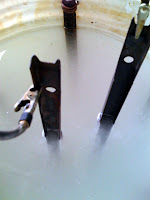 The removal is simple – two 8mm speed nuts from the backside. The crud underneath The paint on the car is original so I wanted to take some care in cleaning the surface. Having said that, the paint is no longer perfect (the previous owner touched up a chip above the “o”) so I wasn’t overly picky. I first soaked the area and got most of the dirt off with a bit of general car wash. Then I used some Turtle Wax ICE Liquid Clay to remove the hard stuff. After a rinse, the outline of the script was still a bit visible but not enough to be a concern. The “t” was also bent a little askew – a careful tweak put it back in place. I noticed that the black painted aluminum had some corrosion on the back; a new OEM badge for this car (930-559-317-00-M260) is relatively cheap at only about $20-25. After scrubbing mine with an old toothbrush and wax remover, it looked almost new. ResultsBefore putting it back on, this is a great time to put on a fresh coat of wax. Instead of wax I used some Turtle Wax ICE Liquid Polish. And no, I’m not being paid by Turtle Wax; I just like their products. Admiring the results I know I will sleep better tonight. 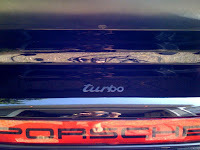 Porsche’s choice of black on black is subtle ...unlike the turbo itself.